Close followers of BrainLazy may have noticed a wee bit of a slump of late. I could go into the details, but suffice to say that we’ve been battling demons of various types for a while, and we’re only now beginning to sift through the things that we missed while we were entrenched in battle. The one that leaped out of our mailboxes and slapped us for missing it the first time is an awesome little game in development by the name of Nioki Adventure, from Bidogames. The term “Sandbox Game” is one that has taken on a number of meanings through the years. At first it was any game with an open world that was fun even in the absence of the main game, such as the GTA series. Eventually, someone realized that a sandbox, in reality, usually involves some level of creativity and constructiveness. Let’s face it, fun though it may be to drive a dump truck off the top of a draw bridge, it is hard to step back afterward and admire your hard work. Then came Minecraft, which made creativity and construction the whole point of the game. In turn, this inspired an offshoot, the “2D Sandbox”. The flag carrier in this case is Terraria, a magnificently addictive game in its own right. Now, as fun as Minecraft and Terraria are, there are a few things they are missing. For one, the both went with retro-style graphics, which are neat, but not everyone’s cup of tea. Also, while GTA was something of a sandbox GAME, Minecraft and Terraria are more of along the lines of SANDBOX game. 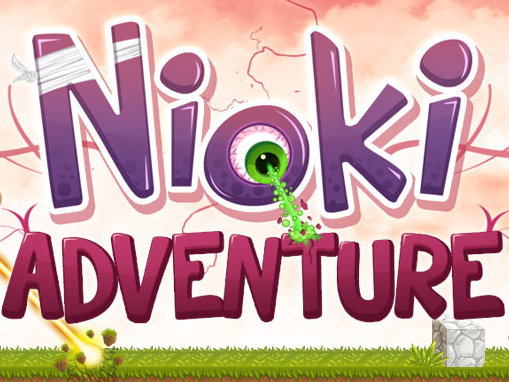 Nioki Adventure is a title that seeks to restore balance to the gameplay and visuals, while still retaining the crafting and building that made those other games so fun. In the visuals department, feast your eyes. They've got depth of field effects, people. DEPTH OF FIELD! Pixelated graphics have a certain appeal, but there is no denying that clean, cartoon-style graphics bring something special to a game. The two screenshots available are absolutely gorgeous, dripping with personality and style. I’m also impressed by the apparent decision to make the main character a giant eyeball. Considering the number of eyeballs I’ve had to slaughter in other games, it is about time one of them got cast in the leading role. I see slimes still haven't made the jump to leading role yet. 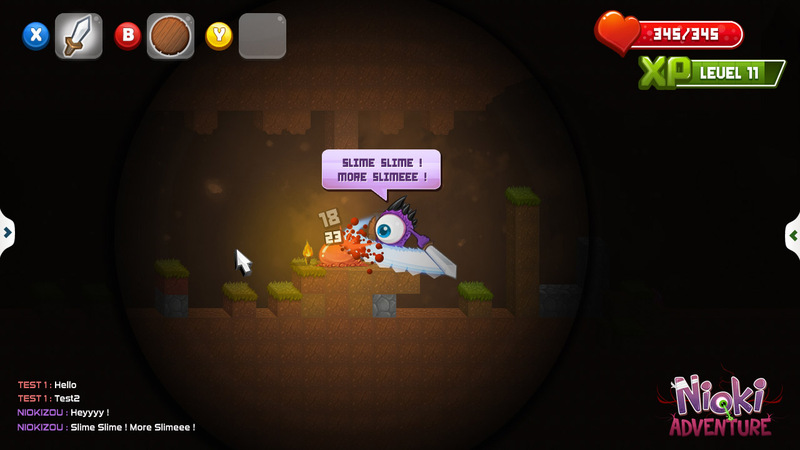 The gameplay enhancements are set to at least match the visual enhancements. The multiplayer, construction, crafting, and exploration that defines the 2D Sandbox genre will be combined with the structure and detail of more traditional RPGs. That means not only boss fights and combat, but skill trees, scripted main quests, side quests, loads of items, character leveling, and more. Perhaps most importantly, though, Bidogames is dedicated to fostering the strong community that is essential to turning a sandbox game into what it should be. You can head over to their website right now and join their forum, where you can keep up with the development of the game and pitch your own ideas for quests, items, crafting recipes, etc. Head on down. I’m sure they’ll be glad to hear from you. 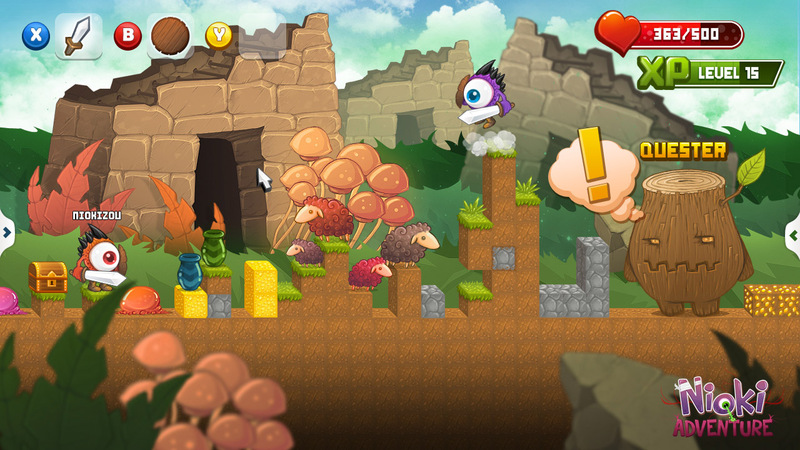 Nioki Adventure is coming to PC and XBLIG.